They’re so overwhelming to shop for, aren’t they? It’s so hard to make a decision, because well, first of all, there are so many to choose from. And if it’s a large one, it’s gonna cost you a good chuck o’ change, and who wants to live with regret if you make the wrong choice? ESPECIALLY if you order something like a 9×12 online and have to ship that bad boy back? Ugh. Gives me a headache just thinking about it. A good friend of mine just bought a large area rug for her family room and it was such a major decision. I did not envy her. Oh the choices! In the end she bit the bullet and bought one online and loved it. So it all turned out good in the end. And for all that “not envying her” business, I turn around and decide to get one soon after!? You see, our large area rug in the family room was reeeaallly looking bad. So bad that my husband even made a comment that we needed a new one! So you know it was in bad shape. It was actually ripping apart a little in the high traffic spots, and getting stained…to the point that I wasn’t even busting out the Resolve anymore. It was time. I tried Target, so that I could return it easily if I didn’t like it, but none that I liked were large enough. I went online and I checked Rugs USA. Ohhhhh thhhheeee choicesssssss. But I came up with a game plan and found THE PERFECT RUG for our room. I’m serious. I’m completely, totally, 100% obsessed with this thing. I keep walking in my family room just to look at it again. Nailed it as they say. And since this ain’t my first rodeo with choosing rugs (and every time I love/hate doing it), I thought my experiences could benefit those of you who are there. Or will be there one day. I asked myself some questions (not out loud – that’d just be weird. But whatever floats your boat.) 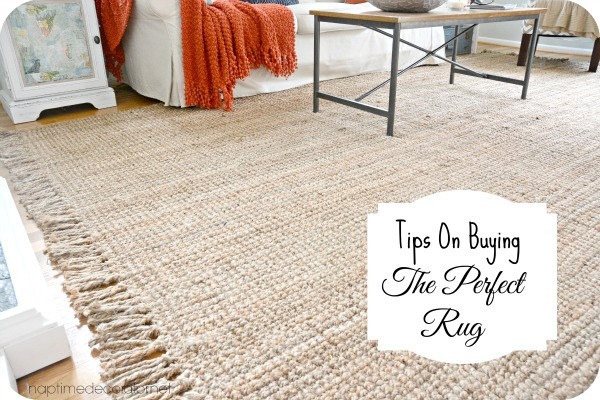 and discovered some great tips along the way should you ever be faced with 897,537,128 rugs online and have zippy clue how to find the right one. 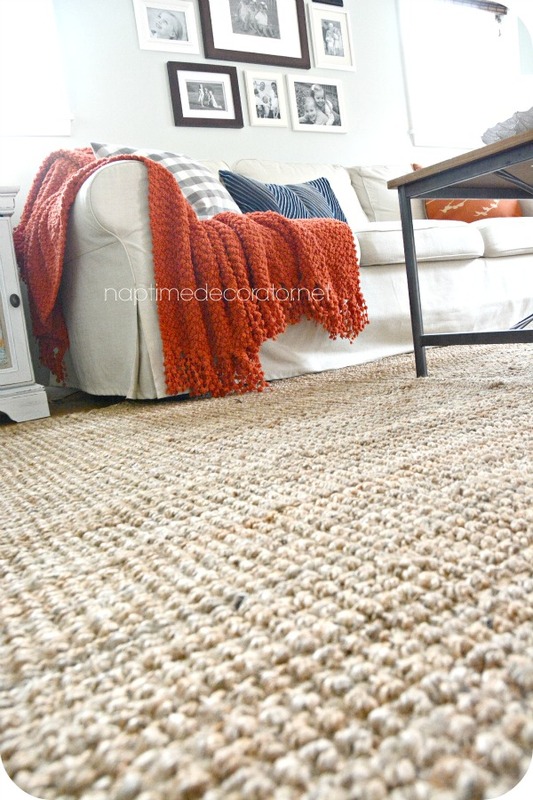 It’s the Maui Chunky Loop rug from Rugs USA. And it’s dreamy. 1. Decide what’s most important to you. First and foremost, this is what you need to figure out. I kept dreaming of some plush-soft-uber-thick-perhaps shag-lusciousness that felt like I was walking on clouds, in a light, subtle print perhaps? But then I remember how much I’d cringe every time someone walked in our house on a wet, rainy day. Especially since our family room is 1.2 steps away from our entry. (That ripping apart, horribly stained high traffic area I was telling you about? Yeah, that’s the one). 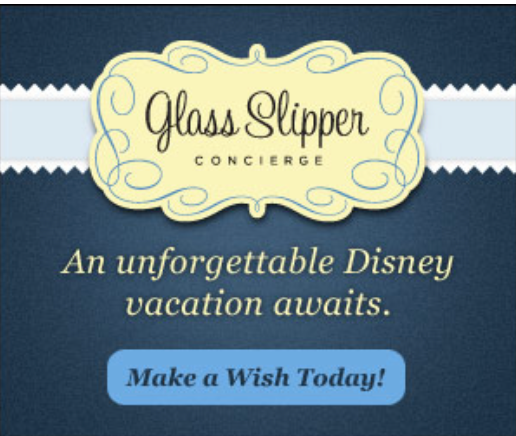 And I’m not comfortable with telling people to remove their shoes. With the amount of people that are in and out of my home every day, it’s all I’d be doing. Not gonna happen. I know me, and I know that I HATE living with a stained rug, and I know that I would hate living with worrying about it getting stained. 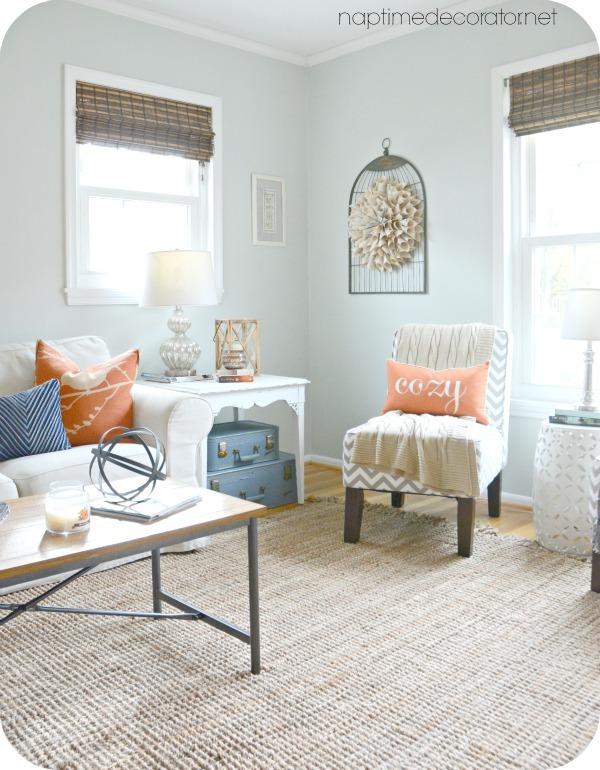 I want a rug that I could care less if my three kiddos and all their friends ran inside with dirty shoes on – so letting go of my super soft light colored rug was totally cool with me if it meant living worry-free. And my friend who just bought her rug had a similar experience with this: Her family room is a little more separated from her entry, so she doesn’t have quite as much traffic going in there as I do. She also has a little one still running around. 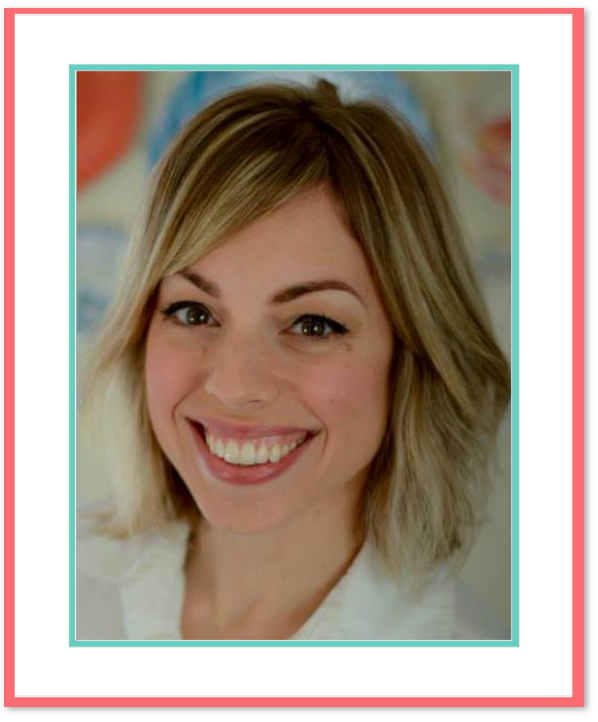 So she wanted something super soft, but dark enough to hide the cookie crumbs;) She found a really cool blue shag rug that has turned out perfectly for her needs – and her little girls love the softness when they’re playing in there. 2. Know yourself. Are you someone who tends to love the hottest trend of the moment, then hate it 6 months later? 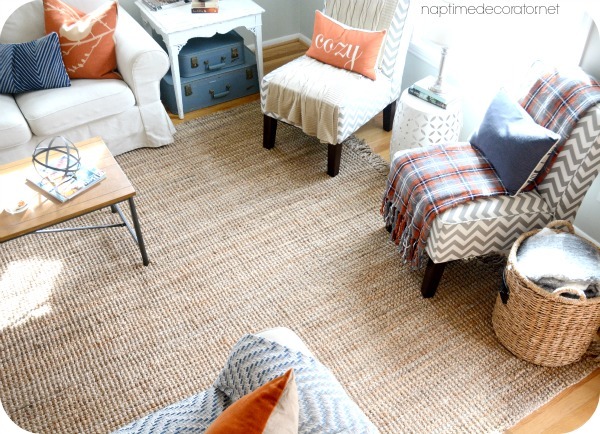 Then avoid a rug with chevron, for example. 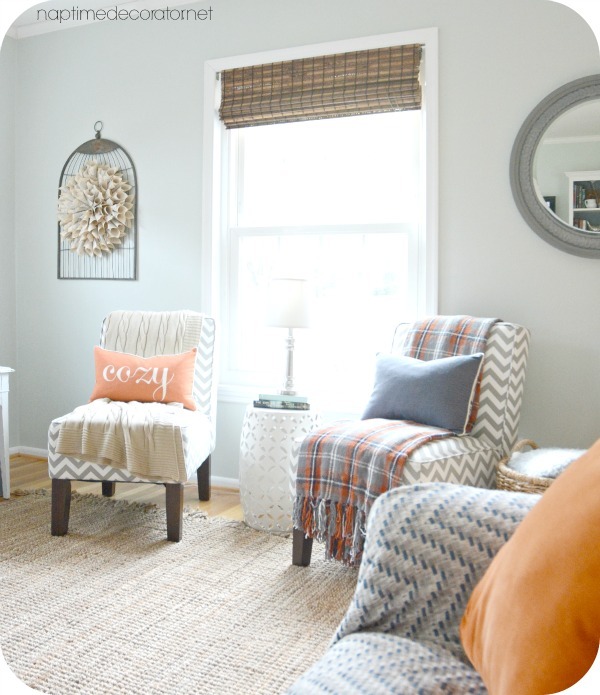 Are you someone who loves to change up your color scheme all the time (hmmm…sounds familiar;) )? Then it’s best to pick a neutral so you can switch up your colors with less expensive things like throw pillows and accessories. Are you bold through and through? 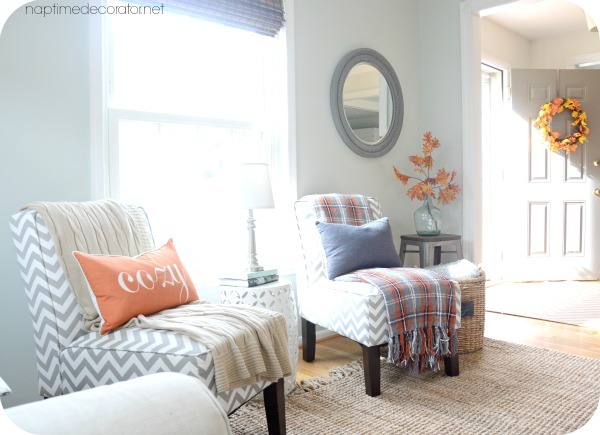 Then don’t be afraid to go bold with your rug, if that’s your thang. 3. Look at your room. The friend I keep talking about – her couches are brown. Her walls are beige. She has curtains with a blue/cream print. The rug was a perfect spot to bring in more color. That’s why she chose the blue. Take a look around at your furniture, at your curtains. Do you have a ton of bold colors and prints already? Maybe go low-key on the floor. 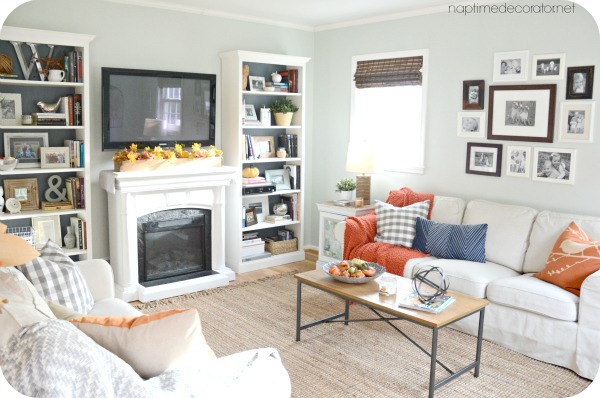 Do you have beige walls and beige couches? Your floor’s the perfect spot to bring in some life. 4. Know your size. Before you start your search, it’s good to know how big you want to go. Me, I like the cozy feel of a big ol’ rug. One that goes under my furniture and almost fills my room. It feels homey to me. (I went with the 8ft 6in x 11ft 6in which ended up being 9×12 with the tassels). You might like more of your hardwoods to show and prefer a smaller one – if you’re stumped, bring one in from another room and try it on for size – literally! If you’re thinking a 5×7 would be perfect and have one in home office, go test it out. Or use masking tape to see what that particular size would look like if you’re unsure. It’s good to know when you’re weeding through gazillions of rugs, if they have that size or not to begin with. 5. Read reviews! Oh goodness gracious can they be handy! This rug had 554 reviews and I’d say 99% were not only good, but outstanding. Things like “My room looks like a Pottery Barn magazine now!” “I want one for EVERY ROOM!” “I am seriously in love!” “Service is great!” The one that really convinced me: “I’ve got four kids and a dog and we cannot mess up this rug!” I mean, I’m not sure I even read a bad one, now that I think about it. That says a lot to me. They did say it shed a little at first, but I can handle that. And yes, they were correct, it did, but nothing bad at all. If there were 554 reviews and I didn’t read a bad one, I feel good about that. 6. Check the return policy. If this is a rug you’re on the fence about – like 50/50 on the fence – check the return policy to make sure it’s all good to send it back, should it err on the bad 50 side. Rugs can be pricey – and online is risky – no one wants a rug to arrive and be less than what you’d hoped for and have to pay an arm and a leg to ship it back. 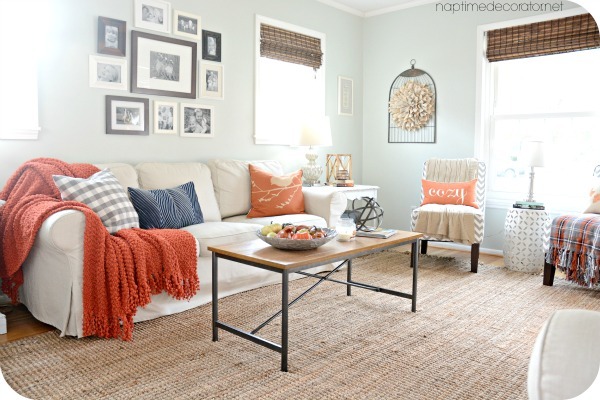 Hi Liz I was looking for a jute rug for my dining room and I just remembered this post! I love the look (and price!) of this rug but am a little hesitant bc of the reviews that say it sheds a lot and requires a lot of vacuuming from the natural fibers. Just wondering how are you liking this rug so far? Would you recommend? I have 2 kids and a dog- don’t think I can handle more mess than I already have!! thanks! I do love it and would recommend it. I don’t find the shedding to be bad – it does shed a little, and if the kids are rolling around on it with dark clothes, I can see the fibers, but other than that, it’s not an issue for us. It is chunky and loopy, which I ADORE, but I wonder if because it’s that way, it would be hard for a dining room, due to pulling out and pushing in chairs, you know? 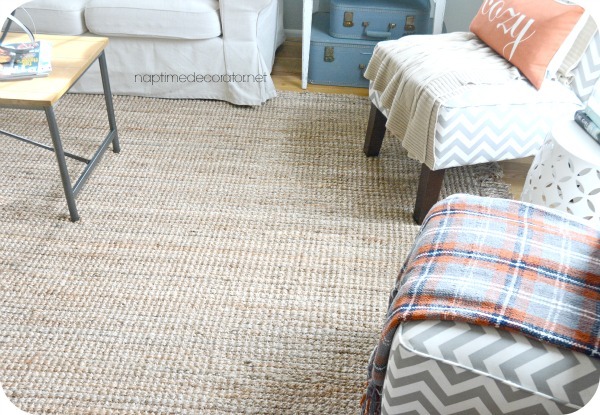 I have a seagrass rug in our dining room that isn’t comfy on the feet, but man, it’s perfect for the dining room! It has that same look, but the chairs don’t get stuck, and they slide very easily, and food spills are so easy to clean up. And the fact that it’s not comfy on your feet doesn’t matter, since it’s a dining room. Good luck! The rug is so gorgeous! Is that the bleached color or the natural color? Would you recommend a rug pad for underneath this rug? How has it held up over time? Does it continue to shed?